Vasculogenic mimicry (VM) gives rise to tumor neovascularization that is critical for tumor growth and metastasis. Long non-coding RNAs (lncRNAs) have been implicated in diverse and fundamental biological processes. LINC00312 is associated with lung adenocarcinoma. In this study, we found that LINC00312 induced migration, invasion and VM of lung cancer cells by direct binding to the transcription factor Y-Box Binding Protein 1 (YBX1). Moreover, we demonstrated that YBX1 is associated with different fragments within 0–2410 nt 5’region of LINC00312. In addition, LINC00312 is associated with VM in 124 lung adenocarcinoma clinical specimens. The results suggest that LINC00312 is a promising therapeutic and diagnostic target for lung adenocarcinoma. Lung cancer is the most common cause of cancer related death in men and women. One of the most common types of lung cancer is NSCLC. Tumor neovascularization provides adequate blood and nutrition supply for tumor progression. Vasculogenic mimicry (VM) is one of the important sources of angiogenesis and nutritional supply in cancer . 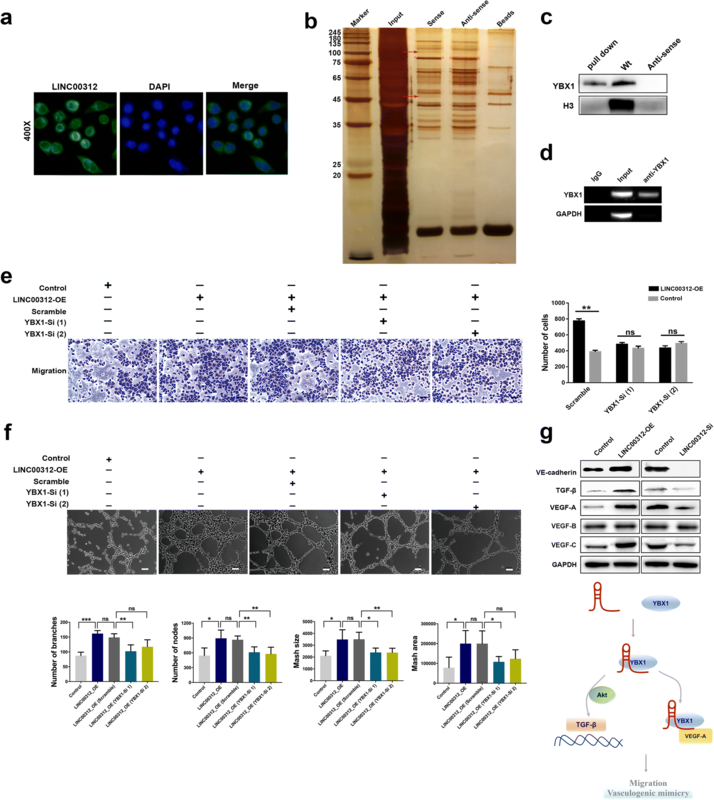 The lncRNA metastasis-associated lung adenocarcinoma transcript 1 (MALAT-1) promotes the formation of VM in vitro, which suggests a role of lncRNA in angiogenesis . We profiled lncRNA expression in lung adenocarcinoma (ADC) and identified LINC00312 as a differentially expressed lncRNA in our previous work [3, 4]. However, whether LINC00312 associated with VM in ADC remains unclear. In this study, we measured the expression level of LINC00312 in 124 paired ADC tumor tissues and its adjacent non-tumor lung tissues using qRT-PCR. LINC00312 expression in patients with ADC metastasis was higher than patients without metastasis (p < 0.0001) (Fig. 1a). The clinicopathological analysis revealed that LINC00312 high expression was associated with lymph node metastasis (p < 0.001), distant metastasis (p < 0.001), tumor node metastasis (TNM) stage (p = 0.042) (Additional file 1: Table S1). To further characterize the role of LINC00312, we measured metastasis of ADC cells in vivo using bioluminescence imaging. 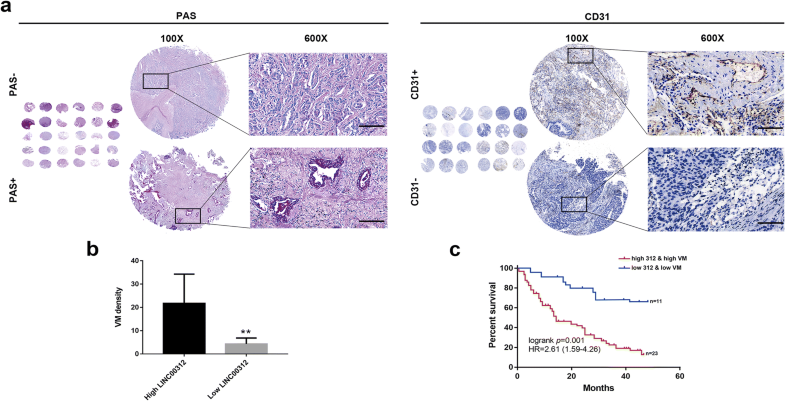 The mice inoculated with the pIRES2-LINC00312 PC-9 overexpression cells exhibited more lung metastatic tumor nodules than the mice inoculated with the control PC-9 cells (Fig. 1b). Increased metastasis to the lung was confirmed by histological analysis. As expected, compared with the control group, pIRES2-LINC00312 PC-9 overexpression group showed more lung metastatic nodules. (Fig. 1c). These results indicate that LINC00312 promotes metastasis in vivo. We further analyzed the effects of ectopic LINC00312 expression on tube formation of ADC cells (H1299 and PC-9) to gain insight into the potential role of LINC00312 in VM formation (Fig. 1 d, e). Our data revealed that the average VM density in tumor tissues formed in LINC00312 overexpression cells was significantly higher than that in control cells (Fig. 1f). Next, we performed CD31 and PAS double staining to explore correlations between LINC00312 and VM in 124 ADC clinical samples. The LINC00312 expression levels and clinicopathological analyses are summarized in Additional file 1: Table S1. We used CD31-/PAS+ as a criterium for VM . Angiogenesis in malignant tumor tissues is associated with a poor clinical outcome in ADC patients, and the patients with VM exhibited greater tumor metastasis and a lower survival rate. Representative images of VM were shown in Fig. 2 a, b and quantified in Additional file 1: Table S1. Patients with simultaneous high levels of LINC00312 expression and high density of VM exhibited a relatively poor prognosis (Fig. 2c). VM is mediated by increased migratory and invasive abilities of cancer cells . The positive correlation between LINC00312 levels and VM prompted us to explore the effects of this lncRNA on ADC cell migration and invasion. We examined the expression of LINC00312 in 6 ADC cell lines. LINC00312 expression was high in H1703 and H2009, low in PC-9, and intermediate in H1299, A549, and H1975 (Additional file 2: Figure S1A). We achieved significant overexpression and knockdown of LINC00312 PC-9 and H1299 cells as validated by RT-PCR, respectively. The PC-9 and H1299 variants were used to explore the functions of LINC00312 in lung cancer cells. To elucidate the mechanisms of LINC00312-mediated VM and metastasis of ADC, we performed wound healing (Additional file 2: Figure S1B), transwell migration, and transwell invasion (Additional file 2: Figure S1C) assays in H1299 and PC-9 with LINC00312 overexpression or knockdown, respectively. The results demonstrated significantly increased migration and invasion as a result of LINC00312 overexpression. In accordance, knockdown of LINC00312 reduced migration and invasion of ADC cell lines. A large number of lncRNAs function through binding to a protein partner. Fluorescent in situ hybridization were performed to examine subcellular localization of LINC00312. The results indicated that LINC00312 was present in the nucleus and cytoplasm (Fig. 3a). To identify the LINC00312 interacting proteins we performed RNA pull-down assay with biotinylated LINC00312, followed by mass spectrometry (MS). Our result indicated that two protein bands were specifically precipitated by LINC00312 in PC-9 in RNA pull-down assay (Fig. 3b). Western blotting was carried out on the protein samples precipitated by the LINC00312 RNA pulldown assays using the antibodies specific for the above candidates. Our results indicated that only YBX1 was precipitated by LINC00312 (Fig. 3c; Additional file 3: Table S2). To further confirm this interaction, we carried out RIP assay using a YBX1-specific antibody, followed by qRT-PCR using the primers specific for LINC00312. As expected, LINC00312 was enriched in the anti-YBX1 group, compared to control IgG group (Fig. 3d). These results indicated that YBX1, a transcription factor that regulates a range of gene expression, directly interacts with LINC00312. To define the region of LINC00312 that was bound by YBX1, we generated three fragments (LINC00312I, LINC00312II, LINC00312III) according to its secondary structure (Additional file 4: Figure S2A). Pull-down assays demonstrated that YBX1 was enriched by both LINC00312I and LINC00312II (Additional file 4: Figure S2B). Western blotting on the proteins isolated from the RNA pulldown assays was used to determine whether YBX1 interacts with LINC00312I and LINC00312II (Additional file 4: Figure S2C). Western blotting further confirmed the results of pulldown assay. Taken together, these data confirmed that YBX1 binds to LINC00312I and LINC00312IIof LINC00312. A prooncogenic role for YBX-1 is suggested by its ability to promote migration and invasion of tumor cells . Importantly, YBX1 up-regulates pro-angiogenic genes expression and plays a critical role in angiogenic switch [7, 8]. Therefore, we hypothesized that LINC00312 induces migration of ADC cell lines through YBX1. To test this hypothesis, we analyzed migration and invasion when YBX1 was knockdown in the LINC00312 overexpression of PC-9. As expected, YBX1 knockdown partially blocked LINC00312-mediated increase in migration and invasion (Fig. 3e). Moreover, VM is regarded as an important source for blood perfusion that supplies nutrients and oxygen to tumor growth and promotes cancer metastasis and progression. We postulate that LINC00312 induces ADC cell’s VM via its binding to YBX1. Thus, we examined LINC00312-mediated VM when YBX1 was knockdown by RNAi. As expected, YBX1 knockdown blocked the LINC00312-mediated VM (Fig. 3f). Quantification from three independent replicates is shown in number of branches, nodes, average mesh size area. These data demonstrate that LINC00312 promotes ADC cell’s VM formation via YBX1. LNC00312 affected many biological processes in ADC cells according to our RNA-seq results. The top GO terms and enriched KEGG pathways are related to YBX1-regulated angiogenic gene expression (Additional file 5: Figure S3). It has been reported that YBX1 promotes TGF-β-induced migration via Akt activation. Elevated YBX1 expression increases cytosolic localization of VE-cadherin . Moreover, YBX1 affects VEGF-A expression by binding to its promoter . Hence, we further investigated whether LINC00312 affected their expression. As expected, western blot assay demonstrated that LINC00312 significantly increased VE-cadherin, TGF-β, VEGF-A and VEGF-C levels (Fig. 3g). We demonstrated that LINC00312 induces lung adenocarcinoma metastasis and VM through direct binding to YBX1. Our study provides a significant advance in the current understanding of the dual roles for LINC00312 in lung cancer. National Natural Science Foundation of China (81572281, 81702278, 81372515, 81402249). All data generated or analyzed in this study are included in this article [and its Additional files]. CJD procided direction and guidance throughout this manuscript. ZZP performed laboratory experiments and was a major contributor to the writing and editing of the manuscript. JW assisted in parts of experiments. BS reviewed and made significant revisions to the manuscript. All authors read and approved the final manuscript.